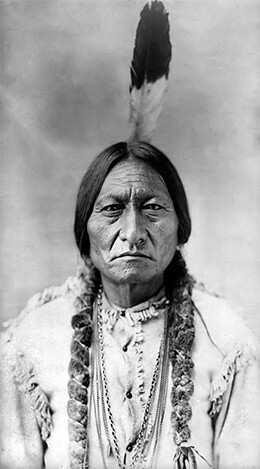 In the Battle of Little Bighorn, perhaps the most famous battle of the American West, a Sioux chieftain, Sitting Bull, urged Indians from all neighboring tribes to join his men in defense of their lands. At the Little Bighorn River, the U.S. Army’s Seventh Cavalry, led by Colonel George Custer, sought a showdown. Driven by his own personal ambition, on June 25, 1876, Custer foolishly attacked what he thought was a minor Indian encampment. Instead, it turned out to be the main Sioux force. The Sioux warriors—nearly three thousand in strength—surrounded and killed Custer and 262 of his men and support units, in the single greatest loss of U.S. troops to an Indian attack in the era of westward expansion. Eyewitness reports of the attack indicated that the victorious Sioux bathed and wrapped Custer’s body in the tradition of a chieftain burial; however, they dismembered many other soldiers’ corpses in order for a few distant observers from Major Marcus Reno’s wounded troops and Captain Frederick Benteen’s company to report back to government officials about the ferocity of the Sioux enemy. Beginning in the 1880s, clergymen, government officials, and social workers all worked to assimilate Indians into American life. 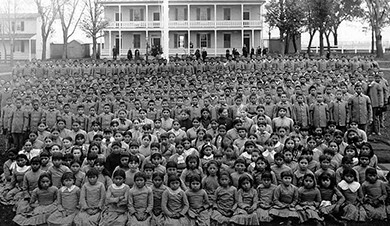 The government permitted reformers to remove Indian children from their homes and place them in boarding schools, such as the Carlisle Indian School or the Hampton Institute, where they were taught to abandon their tribal traditions and embrace the tools of American productivity, modesty, and sanctity through total immersion. Such schools not only acculturated Indian boys and girls, but also provided vocational training for males and domestic science classes for females. Adults were also targeted by religious reformers, specifically evangelical Protestants as well as a number of Catholics, who sought to convince Indians to abandon their language, clothing, and social customs for a more Euro-American lifestyle.